We are currently still working on building this site, but soon you will be able to visit us to find out all about the evolution and activity of Nisyros volcano, the scientific research and monitoring we do here and how you can visit and get involved. In the meantime, here is some information about the amazing volcano that is Nisyros island! The exact date of the last magmatic eruption on Nisyros is not known, but geological evidence indicates that it was within the last 31,000 years. Nisyros currently hosts an active hydrothermal system - with surface expressions including steaming fumaroles, boiling acidic mudpools and hotsprings. It has experienced numerous explosive phreatic eruptions in historic times, which created the large craters inside the Nisyros caldera - these are today visited by thousands of tourists each year. Many people refer to Nisyros' most famous crater "Stefanos" as being "the volcano" - but these craters are really just tiny blisters on the surface of the entire volcanic edifice. The whole island is the volcano! The island itself, its caldera and the large mountainous domes inside the caldera, were all formed by magmatic eruptions. Nisyros has had many explosive magmatic eruptions, which have ejected material high into the sky and sent pyroclastic flows billowing down its flanks; and also more effusive, quieter eruptions of lava, which have dribbled more slowly down the sides of the island and built up large domes. Over time, these alternating explosive and effusive eruptions built up the complex stratocone that makes up the current island. The largest and most recent explosive eruptions on Nisyros created the Island's central caldera. These were Plinian events, that generated eruption columns several kilometers high and many large pyroclastic flows. During these events, so much magma was erupted that it emptied the magma chamber, causing the ground above to collapse down into it - creating the subsidence caldera we see today. The Nisyros magma chamber then re-filled and erupted the six large lava domes that now fill the western side of the Nisyros caldera. These domes were the last magmatic eruptions on Nisyros. Phreatic eruptions do not involve magma (other than as a heat source) - they are steam explosions that occur in the hot geothermal reservoir beneath the suface. These powerful explosions can destroy the ground above them to create craters (like a bomb buried beneath the ground). This is how the many craters inside the Nisyros caldera were generated, including Stefanos crater. 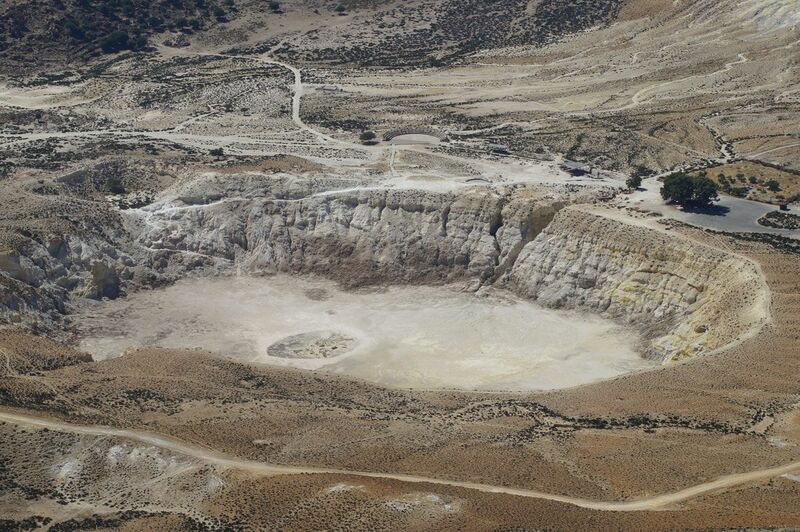 There have been thirteen phreatic eruptions in the Nisyros caldera, most recently during 1871-1873 and in 1888. Phreatic explosions can occur without any warning, and are often triggered by earthquakes. Nisyros has shown signs of volcanic unrest in recent years, which suggest that there is still magma moving about beneath, and off-shore of, the island. In 1995-98 Nisyros experienced a 'volcano-seismic crisis', with many earthquakes, ground deformation and changes in the chemistry of its fumaroles. Since then, a large fracture and sinkholes have developed in the caldera, and in 2014-15 there was another period of increased local seismicity. The volcano's active hydrothermal system continues to emit fumaroles and hotsprings. Another volcanic eruption at Nisyros is therefore possible. We would expect to see further warning signs before a magmatic eruption, but it is much harder to predict a phreatic event. Nisyros is an active volcanic island, located at the eastern end of the South Aegean Active Volcanic Arc - a chain of volcanoes related to the subduction of the African plate northwards beneath Europe. It is probably one of the least publicly known of the volcanoes in this arc - but most people know of its western neighbour Santorini. The entire 8 km-wide island of Nisyros is a volcano, every rock you see came from volcanic activity. It began life as a submarine volcano, erupting pillow lavas beneath the sea. 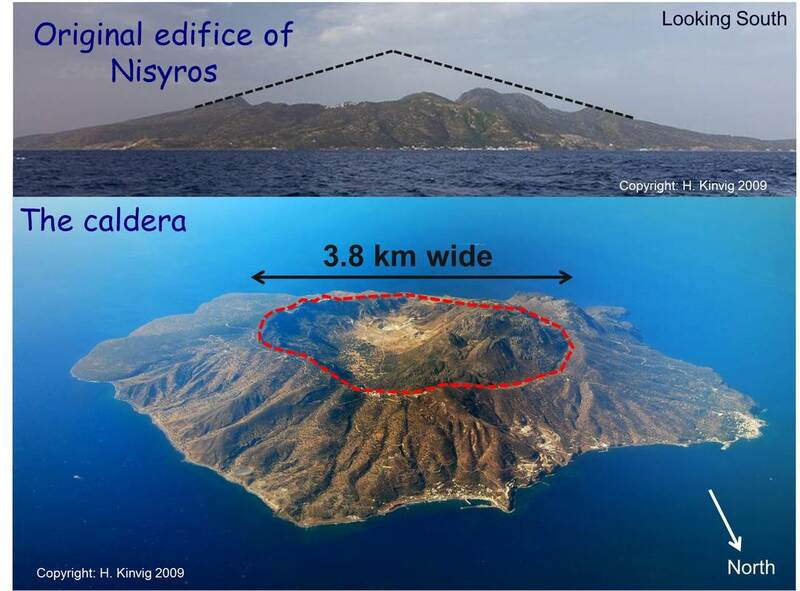 Eventually, Nisyros emerged above sea-level (approx. 161,000 years ago), and built up a complex stratocone from the deposits of both explosive and effusive eruptions. It hosts a 3.8 km-wide central caldera, which was produced by two explosive Plinian eruptions, approximately 40,000 years ago. Nisyros itself sits on the inferred edge of the huge submarine caldera, produced by one of Europe's largest ever eruptions - the Kos Plateau Tuff. The sea between Kos and Nisyros is a giant caldera! Many of the islands that surround Nisyros are also volcanic in origin - for example Yali, which is currently mined for its pumice and obsidian. 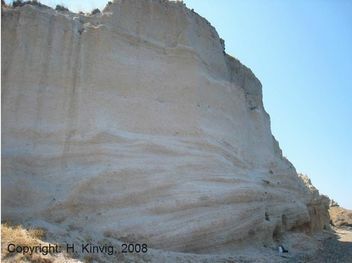 Ignimbrites on Nisyros - deposited by pyroclastic flows. 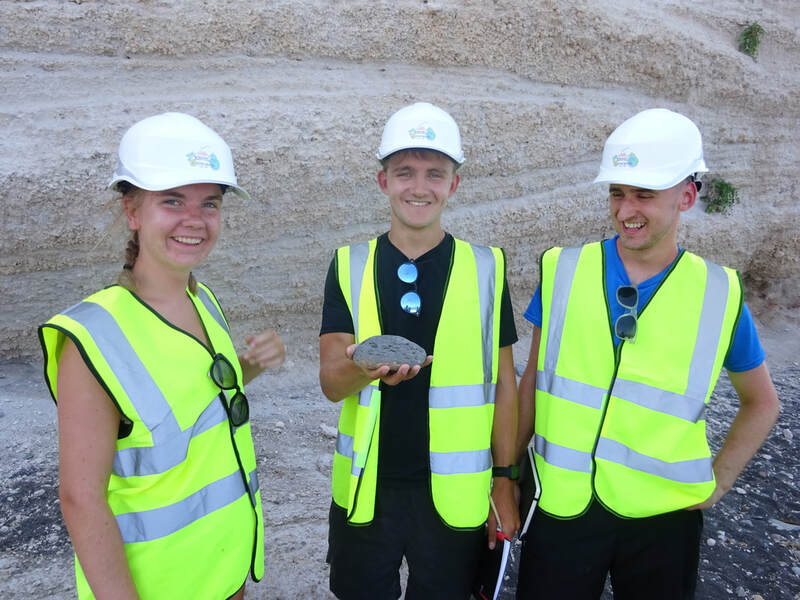 If you are interested in learning more about volcanoes and would like to visit Nisyros on a tour with a fully qualified, professional volcanologist - check out Kinvig Geoscience! 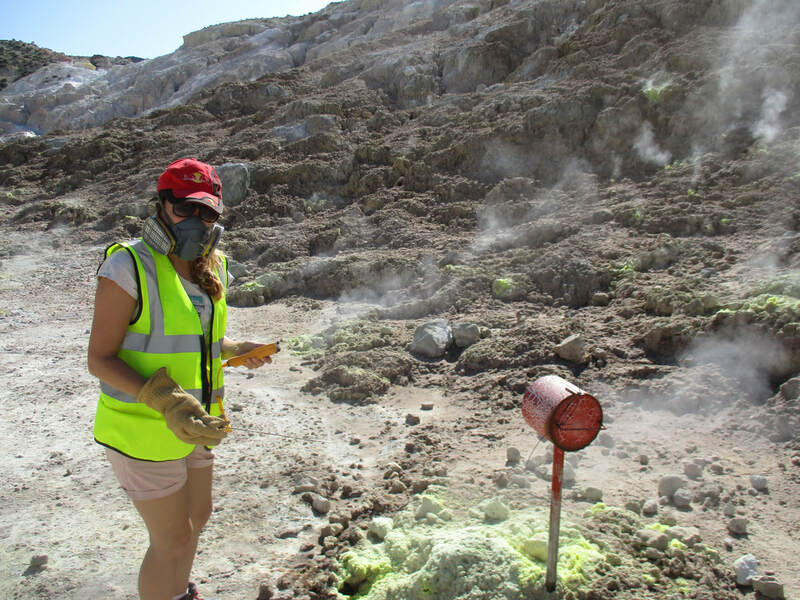 They have unrivalled expertise on the volcanic deposits and activity of Nisyros, and offer the opportunity to go into the craters and measure the temperatures of its active features for yourselves. This website is currently under construction... but we will add more information about the evolution and activity of Nisyros volcano soon. So keep checking back!